It is not too early to start prepping for ice fishing. Skim ice is already showing up on many local waters. It won’t be long until we are fishing the hard water. Many anglers go ice fishing but few catch fish. This is a huge distinction. 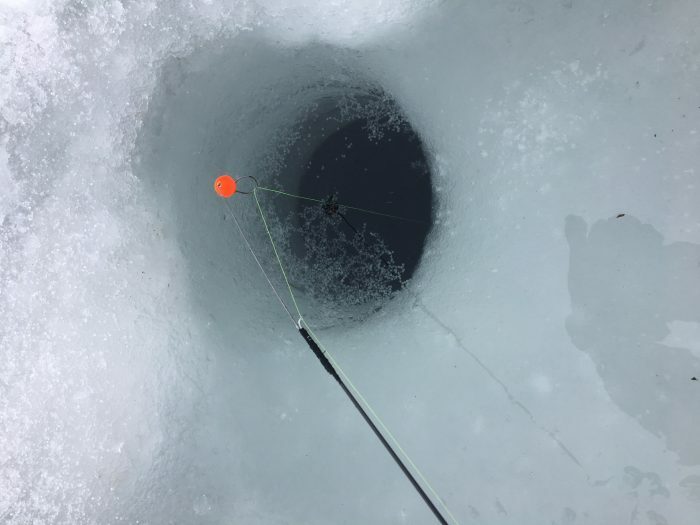 Many ice anglers never sees any bites. A few years ago, I was fishing a high mountain lake with a novice ice fisherman. He had all of the right gear but rarely caught anything. We sat several feet apart and began fishing. Within a half hour, I iced my limit and more. He had yet to set the hook. I added indicators to his rod tips and within minutes he had figured it out. Here is a Tip to help you see more light bites. If you are not using strike indicators, then you are missing the boat. These light action spring, wire, flexible tip attachments will show even the smallest bites. You may need to use stiffer wire or springs depending upon how big and heavy your lures are. Use the lightest indicator you can. 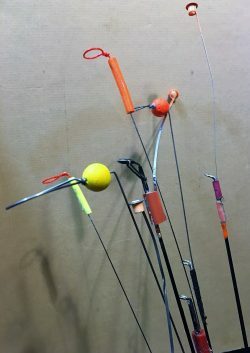 You can purchase these indicators or use thin spring wire and colorful Styrofoam balls to make your own. Attach them to your rod tip securely. Silicon sealers like GOOP will help. You can also use thread to rod wrap the indicators in place. Electric tape will do in a pinch. You want the indicator to bounce. It should be an extension of the rod tip. If it is bent down toward the hole, due to your heavy lure, then use a stiffer indicator. Watch your indicators closely. I position my rods in a 180 degrees arc. My seat is in the center with the Fish Finder in a separate hole. I want to be able to set the hook quickly when I see ANY movement of the strike indicator. If you can’t touch each rod from your seated position, you will miss seeing and reacting to these lite bites. Some bites will look different. If the fish is coming up to the jig, the indicator will move up instead of down. Set the hook! For more Montana Grant, find him getting ready at www.montanagrantfishing.com.